The Farlanders addon will show you what endermen can be. There are six new beings each of which has a general resemblance to conventional endermen. All of them perform certain tasks and can trade, defend and attack. Thanks to a wide range of functions, the new mobs perfectly replace the standard ones and look especially. This addon originates from The Farlanders mod of Minecraft PC which expands the player's capabilities, allowing you to trade, tame and create battles. There are most of these functions here, but since the addon only replaces some mobs and does not contain new structures, this can not be called a full-fledged modification. Of course, the installation will not cause you problems. Taming. 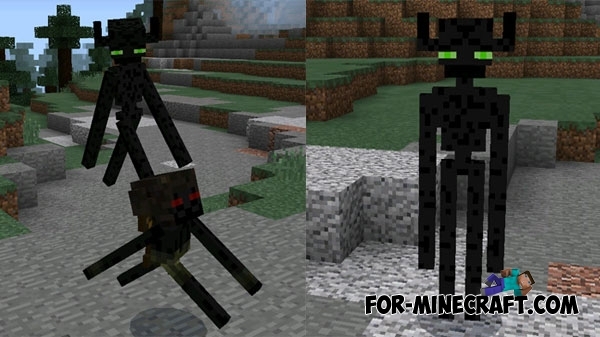 When you come across a small enderman with green eyes, you know that you can tame it using apples. A tamed creature performs the same tasks as a dog. 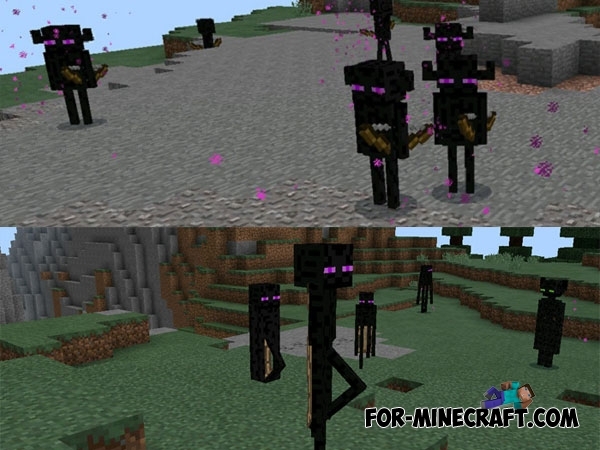 Endermen with white eyes and small stature can trade with you following the example of villagers. But as a currency, you will use rubies that can be exchanged for items. The Farlanders addon adds mobs who love fights. Instead of a golem you will summon a tall dark creature that can defeat attackers. Harmless at first glance, the dwarf opposes it, but the appearance is deceptive. The other endermenes do not require description, they are very common in the ordinary world and have changed textures.